The Hotel Schweizerhof Bern with its great history fits its location perfectly since there is hardly any other city that has preserved its historical traits as Bern, the capital of Switzerland. Following a two-year comprehensive renovation, the hotel really shines and radiates an aura of great history and grand style. Our arrival is smoothly, with some healthy refreshments and instant check in at the Lobby-Lounge-Bar. The area invites us to sit down and relax in the many little seats to meet and relax and has a beautiful bar area. The hotel reflects a nice mix of tradition and modernity with the very friendly staff offering lots of wonderful information on best places to visit, giving us a map circling must see places. Once checked in, we are shown to our Family Two Bedroom, which are two separate rooms but with a hallway and lockable door at the front. They are elegantly furnished, spacious and give us a big smile on our faces. The hotel lies literally across the railway station, but no sound of it can be heard as long as you keep the windows closed. It’s almost as silence as in the mountains around. Of course, the hotel offers several other type of rooms at your convenience, including a Family Three Bedroom, themed Suites and a Studio with a fully equipped kitchen. All well designed and comfortable. And how about the special ‘art rooms’ on the 3rd floor? With still a little afternoon sun, we don’t want to miss the Sky Terrace above Bern’s rooftops. Such a stunning place to see the city and enjoy the mountain views. A sign explains all about the mountain range; it looks like the Finsteraarhorn with 4274m is the highest around. 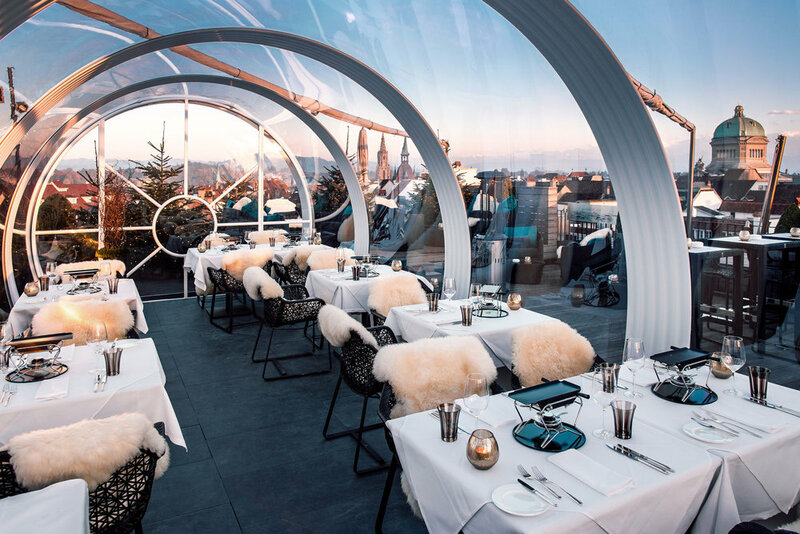 We enjoy a drink here, but when it’s somewhat chilly, you can have a cozy dinner here within the huge transparent tent while looking over Bern by night. The roof is also buzzing with three “mini-hotels” of bees, in this way Hotel Schweizerhof Bern has become an advocate for the dissemination of urban bee colonies. Since there are rarely no pesticides in the city and a large diversity of flowers, the bees can really see the rooftop as their home. A great effort with respect to sustainability the hotel is doing since 2016. Back in “our” home-away-from-home, we hurry to change for the hotelpool, which is only available for children from 16.00-17.00 hours. 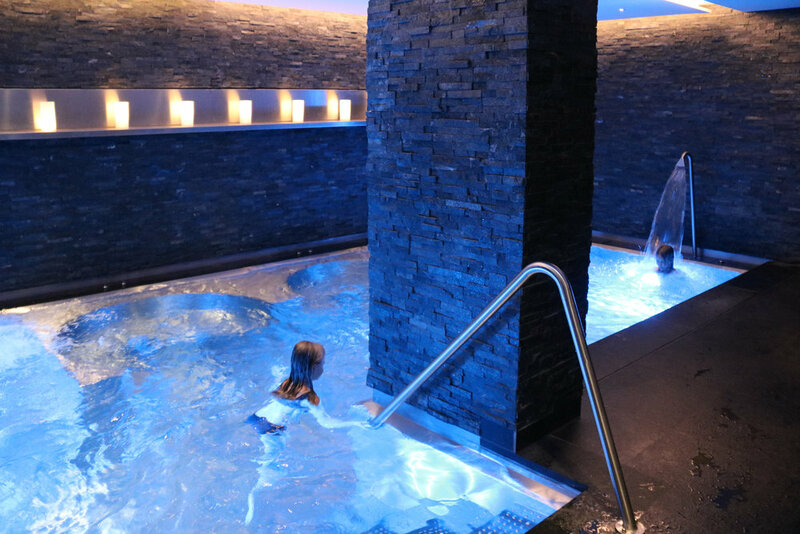 In the heart of Bern over 500 square metres, we find an intimate pool, a sauna, hammam facilities, fitness and treatment rooms. Followed by some time to relax; the girls enjoy themselves with a few Nintendo games provided to us by the staff. An opportunity for us to enjoy a nice bath in the wonderful bathroom with even a TV-screen in it. So, after a while, it’s a bit disappointing for the girls when we tell them to leave for dinner; the games seem to do what they are designed for. We really like to try the famous and best Wiener schnitzel of Switzerland in Jack's Brasserie attached to the hotel (and where we are having breakfast as well). As we sit down, we are surprised to see how many famous people have their inscriptions in the benches. Of course, it would have been great to have our own inscription here, but we do understand we have to be here on a more regular basis. Musicians, poets, artists, singers, actress, football players and politicians have been here often, reminding us of 140 years of history. We particularly like the concept of food boxes, allowing you to take food home that you didn’t finish when dining in their restaurants. Again, a great example of sustainability, and yes: given the size of the schnitzel, we do understand this is done quite frequently. It’s just too good to waist. After a splendid sleep we enjoy a good breakfast in the same brasserie, but no time to waist. The Old Town of Bern is on the list of UNESCO World Cultural goods because of its medieval character that has remained essentially unchanged since its construction during the twelfth to the fifteenth century. We can imagine the river Aare in Summer does invite you or your children to an ultimate swimming pleasure. Yes, you can swim in it, for example by going inside Marzili swimming pool. Note: only good, experienced swimmers can float in the clean river with a view of the nearby Bundeshaus: there are warning signs to indicate when you must go out of the water. Also, in the course of the river are the botanical garden and the Old Town district of Matte. Several constructions merit special mention: the Münster Cathedral, the Parliament Buildings, Lower Gate bridge (the oldest bridge in Bern still in existence), the Nydegg Church, the Holy Gost Church and the many fountains. It is also nice to visit the Zytglogge, the oldest tower bell of the city. This structure is accessible with a tour and has all kind of small stairs up. The same river flows along Dählhölzi Zoo, in which the BärenPark is located. Bern and the bear, his weapon animal, are inextricably linked. Local legend has it that the founder of Bern in 1191 vowed to name the city after the first animal he met on the hunt, which turned out to be a bear. The park looks like a natural environment where the bears can can roam freely. Sadly, we did have quite a bit of rain during our visit, no worries as Bern has 6 kilometers of arcades, the so-called galleries, one of the longest against the weather protected shopping promenades of Europe. Or head to children museum Creaviva where you can all familiarize yourselves with art through playing with shapes, colors and sounds. But as our girls can’t get enough of swimming this time, so as the forecast is quite cloudy, we decide to try Bern Aqua. This is the largest adventure pool in the region, included in the Westside Bern Mall an architectural attraction itself. With around 2000 m2 of Water Area, Bern Aqua has different indoor and outdoor pools, plus three giant slides and a whitewater canyon – including Switzerland's longest covered slide. Around Bern you can walk up or cycle The Gurten, the famous mountain of Bern. On the mountain is a park, there are playgrounds and restaurants and the view of the city is beautiful. In Winter, for those eager to get on skies or snowboard for one or two days and not wanting to move: it’s not that far before you hit the slopes. Multiple areas in the neighborhood are well rewarded, including Adelboden/Lenk and Rinderberg. 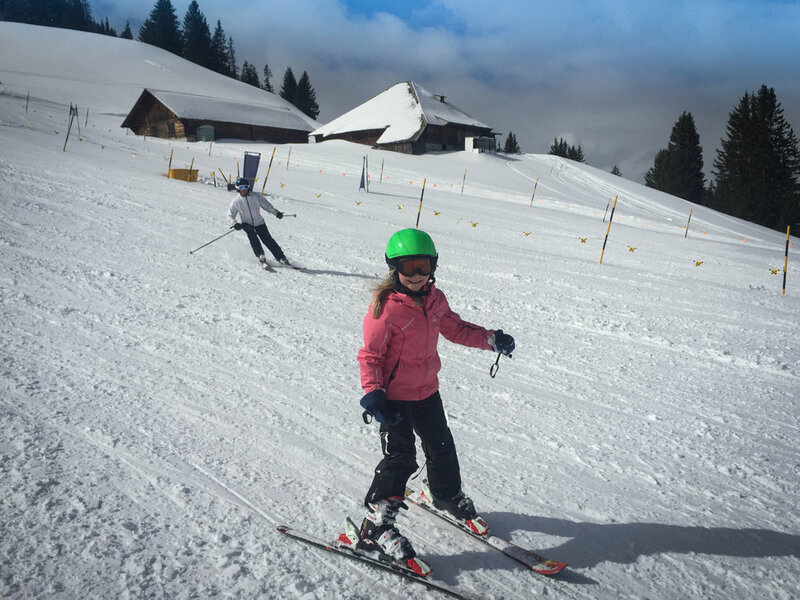 We are having some great skiing time in SaanenMöser/Gstaad (about one hour driving from Bern). # We had a fully satisfying time at Hotel Schweizerhof Bern with a great sleep in wonderful spacious rooms. The sky terrace is just amazing and yes, the pool and sauna are worth to dive in. 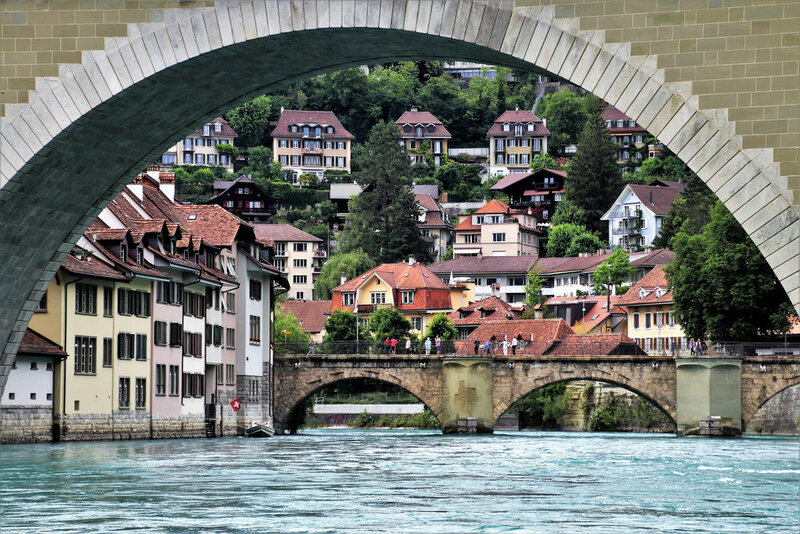 # It’s central location is perfect for a day or weekend trip in or around Bern. # The hotel shows fabulous service from the whole staff. Their commitment is obvious and maybe best shown by the fact that the hotel ranks fifth on the list of Best Employers of Switzerland 2018.